Download our schedule of programs and Black History Month poster. The Department of Africology is pleased to co-sponsor the film Hold Back (Rengaine) as part of the 2015 French Films Festival. African Cultural Night promises an experience like no other. It offers a slight glance at the different aspects of African culture like dance, music, fashion, food and so much more! For more information, contact Ali Yusuf, African Student Association: 414-467-0788 / aliyusuf@uwm.edu. Sponsored by African Student Association and Union Sociocultural Programming. Free and open to UWM students, staff and faculty. Freedom Summer (2014, 120 minutes) expertly combines archival footage and photos with contemporary interviews to recall the pivotal 10-week period in 1964 when hundreds of activists, black and white, worked together to shatter the foundations of white supremacy in violently segregationist Mississippi. Bus to Freedom: Freedom Summer Pilgrimage (2014, 30 minutes) is a poetic multi-media journal that captures the experiences of Milwaukee Public Schools students, teachers, UWM students and activists during a 6-day pilgrimage to attend the 50th Anniversary Celebration of Freedom Summer. Post-screening discussion to follow. Directed by acclaimed filmmaker Stanley Nelson. For more information, contact Union Sociocultural Programming: 414-229-3894 / sociocul@uwm.edu. Sponsored by Union Sociocultural Programming and the UWM Union Theatre. Free and open to the public. Living Thinkers: An Autobiography of Black Women in the Ivory Tower examines the intersection of race, class and gender for Black women professors and administrators working in U.S. colleges and universities today. Through their diverse narratives from girlhood to the present, Black women from different disciplines share experiences that have shaped them, including segregated schooling as children, and the trials, disappointments and triumphs encountered in academia. For more information, contact the UWM Women’s Resource Center: 414-229-2852 / wmncntr@uwm.edu. Sponsored by UWM Women’s Resource Center, Sociocultural Programming, and the Multicultural Student Centers. Black History Month at UWM presents a Panel and Reception entitled Sisters Like Me. Following a series of dynamic programs honoring Black History month, we join together at this event to celebrate, inspire and support UWM women students of African descent. For more information, contact Monique Liston, UWM Women’s Resource Center: 414-229-2852 / wmncntr@uwm.edu. This event is sponsored by UWM Black Cultural Center, Student Union. The lecture is free for UWM students. The 10th Annual African American Film Series presents The Hip-Hop Fellow. This film is a documentary following Grammy Award winning producer 9th Wonder’s tenure at Harvard University as he teaches ‘The Standards of Hip-Hop’ course, conducts research for his thesis and explores hip-hop’s history, culture and role in academia. (2014, 78 minutes) Post-screening discussion to follow. 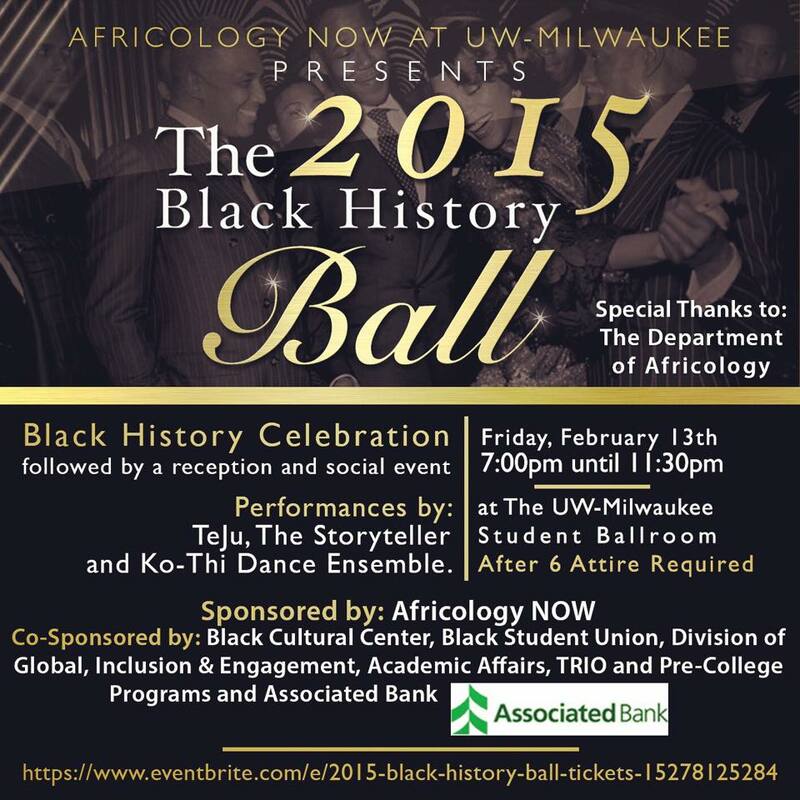 The Black History Ball is UWM’s premiere Black History Month social event! Hor d’oeuvres will be served during the reception. For more information, contact Anastacia Scott, Africology NOW: 414-229-4842 / ajscott@uwm.edu. The Ball is sponsored by Africology NOW, Co-Sponsored by Black Cultural Center, Division of Global, Inclusion & Engagement, TRIO & Pre-College Programs, Black Student Union.